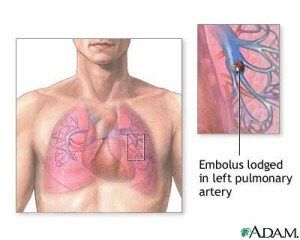 Air emboli usually result from air entering the sirculatory system through intravascular catheters. Fat emboli occur with long-bone fractures. The signs and symptoms are non-specific. The hemodynamic effects depend on the size of embolus, presence of cardiopulmonary disease, and the neurohormonal response to the embolus. The patient may be apprehensive and exhibit dyspnea, pleuritic pain, hemoptysis, tachycardia, tachypnea, crackles, cough, diaphoresis, and syncope. Nursing Diagnosis: Impaired gas exchange related to ventilation perfusion mismatch and/ or hypoventilation secondary to pain. RR 12 to 20 breaths/minute, eupnea. Continuously monitor oxygen saturation with pulse oximetry (Spo2). Carefully monitor patient activities and interventions that may adversely affect oxygen saturation. Continuously monitor ECG for dysrhythmias or ischemic changes. Calculate P (a/A) o2 ratio to evaluate intrapulmonary shunt. Assess respiratory status: note rate and depth of respirations. Observe for dyspnea and restlessness. Hypoxia may be manifested as increased restlessness or change in level of consciousness and respiratory rate > 30 breaths/min. Auscultate breath sounds such as crackles and pleuritic rub may be present. Perform systematic initial and ongoing pain assessment such as intensity, location, quality, aggravating and relieving factors. Use a self-report pain rating scale, such as 0-to-10 numerical pain rating scale, to assess pain intensity in patients who are awake and oriented. Assess for behaviors such as grimacing, groaning, grunting, sobbing, crying, irritability, withdrawing, or hostility because they may be signs of pain. However, the absence of these behaviors does not necessarily mean the absence of pain. Assess for physiologic indicators, such as increased RR, HR, and B; dilated or constricted pupils and pallor, which may be signs of pain. Review ABGs for changes inSao2 and Pao2 to evaluate improvement or deterioration in the patient’s pulmonary status. Place the patient on bed rest initially and assist the patient to assume a comfortable position. Administer supplemental oxygen as ordered. Intubation and mechanical ventilation may be required. Pace activities to decrease the patient’s oxygen demand, allowing adequate time for patient recovery. Administer analgesics as ordered to prevent splinting and improve chest excursion.